VANCOUVER, BC, January 26, 2012. Mirasol Resources Ltd. (TSX-V: MRZ, Frankfurt: M8R) is pleased to announce partial assay results for Phase 3 diamond drilling at the Virginia Project which was completed in December 2011, including complete drill results from the Martina and Naty Extension vein holes, and partial assay results from the Ely South Vein. 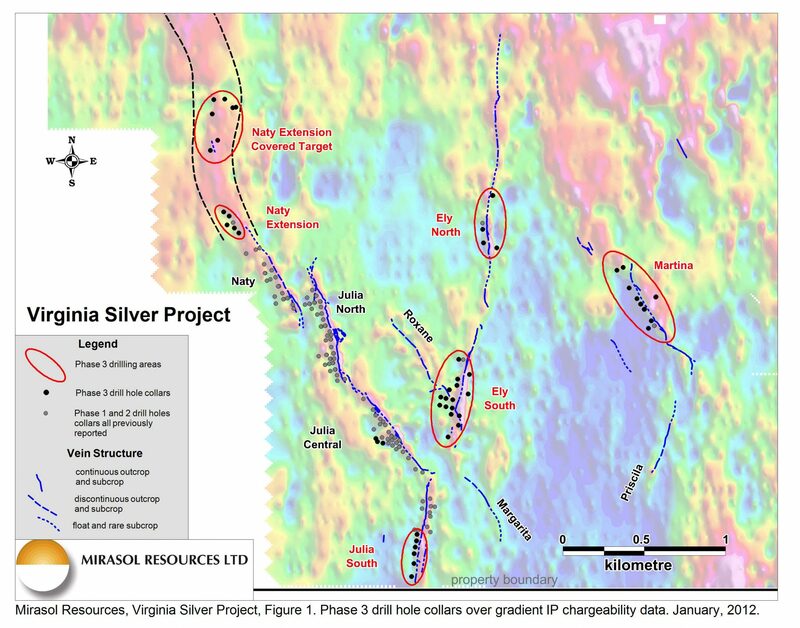 Phase 3 drilling indicates that Martina and Ely South are likely to host silver deposits which add to the four previously discovered deposits (Julia North, Central and South veins, and Naty Vein) on the 100%-owned Virginia Silver Project in Santa Cruz Province, Argentina. Highlights at Naty Extension include 1.5 metres of 797 grams per tonne (g/t) silver in VG-096 and 2.0 metres of 214 g/t silver including 0.3 metres of 1,195 g/t silver in VG-097 (Table 1). 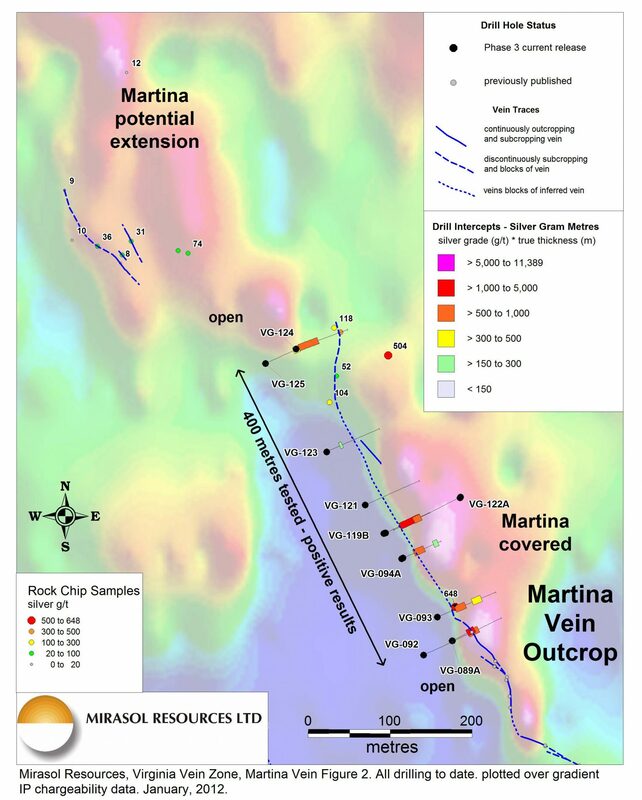 Martina Vein highlights include 3.8 metres of 155 g/t silver within a broad intercept of 25.4 metres grading 61 g/t silver in VG-119B, and 10.9 metres of 63 g/t silver, including 1.1 metres of 141 g/t silver, in VG-122A. Ely South highlights include 21.8 metres of 79 g/t silver including 1.9 metres of 495 g/t silver in VG-113, and 18.2 metres of 63 g/t silver including 4.5 metres of 109 g/t silver in VG-111. Phase 3 drilling was undertaken in five principle areas, four of which previously had a single scout hole (Figure 1). Results are reported herein for all Phase 3 holes drilled at the Martina Vein, all holes drilled at Naty Extension, and the first eight holes at Ely South (Table 1). Remaining holes at Ely South, Ely North, Julia South and three holes at Julia Central, will be reported in future news releases when assays are received. In Phase 3 nine new holes were drilled at the Martina Vein northwest of scout hole VG-089A (Figure 2). Eight of nine Martina holes contained significant intercepts above a 30 g/t silver cutoff. Martina is characterized by broad, often 10 to 20 metre wide, intercepts of silver mineralization hosted by oxidized, brecciated, altered rock and minor quartz veinlets. Typically in these shallow holes a strong, central vein is not well developed. It is interpreted that the level of exposure of the hydrothermal vein may be higher than in the Julia Vein to the west, suggesting that deeper drilling could encounter better silver values at depth. Several new holes were twinned to improve sample recovery and ensure that lower recovery did not affect the assay results. In two cases improved recovery resulted in little change in the assay values, and in the other case grades were somewhat lower (Appendix A). To date, Martina has been tested by ten holes along 400 metres of strike length and remains open along strike in both directions and to depth. Drilling at Naty Extension included five new holes near VG-086, a scout hole drilled during Phase 2. These holes intersected mineralization of variable grade and thickness with local high grade values (Figure 3). Farther north, a second cluster of seven holes targeted an IP chargeability anomaly in an area with little or no outcrop, where prospecting had located scattered mineralized quartz vein float blocks. Holes directed at the IP chargeability anomaly (VG-098, 099 and 100) did not intersect mineralization as expected but did cut wide zones of pervasive silicification with silver values of less than 30 g/t yet failed to explain the source of mineralized quartz blocks. Additional holes VG-101, 102 and 103 were drilled further uphill and to the east along magnetic lineaments parallel to the IP chargeability anomaly and intersected metre-scale, silver bearing quartz veins. The chargeability anomaly remains unexplained, as this type of pervasive silicification, lacking abundant iron oxides, has not been noted previously at Virginia. Additional interpretation is required, but it is possible that the source of the IP chargeability anomaly lies at greater depth, beneath the broad silicification. If so, further drilling is warranted. A 390 metre long chargeability anomaly between the two areas remains untested. At Ely South, assays are presented for eight new holes, and results are pending for eight additional holes drilled to greater depth and along strike to the south (Figure 3). All Ely South holes contain intercepts exceeding 30 g/t silver cutoff, with excellent core recovery in the mineralized zones (Appendix A). Based on early visual observations, additional holes were drilled to depth at Ely South. Visual observations from the deeper holes suggest that the silver mineralization continues to depth. The presence of silver sulphosalts similar to those identified in the Julia Vein, were also observed at depth in the Ely Vein. To date, Ely South silver mineralization has been confirmed at or near surface over a strike length of 345 metres, and remains open along strike and at depth. 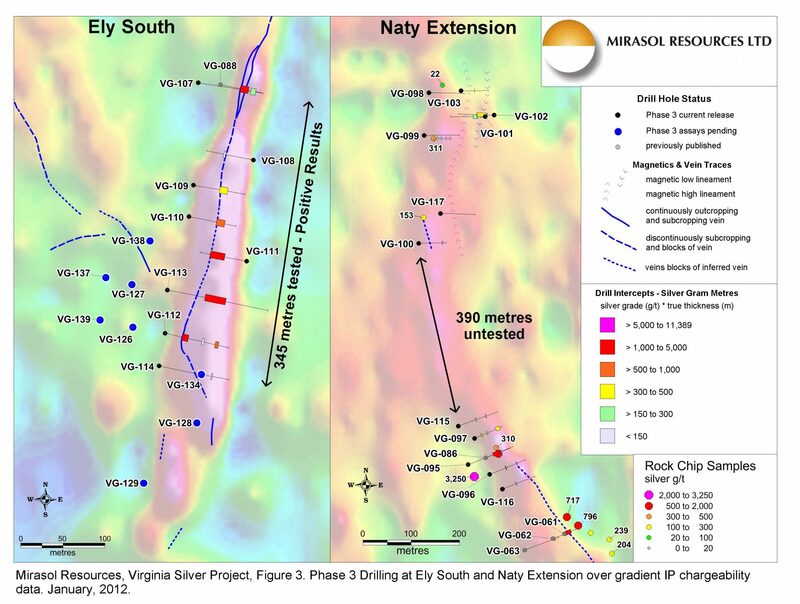 “Initial Phase 3 drilling results indicate that the Martina and Ely South veins are taking shape as new silver deposits and therefore expand the Virginia Project’s scope to six silver zones”, stated Mary Little, Mirasol’s president. Drilling already underway as Phase 4 is expected to expand these six deposits along strike and to depth. The new Martina and Ely South discoveries share characteristics with the Julia — Naty vein system in that they are deeply oxidized, near-surface deposits and have potential for definition of high-quality, silver mineralization that may be amenable to low cost, open-cut mining techniques.